DNA methylation involves the addition of methyl groups (-CH3) to DNA nucleotides. Specifically, these methyl groups most often attach to cytosine residues in the DNA double helix. In mammals and other vertebrates, 1 out of 100 nucleotides bears an added methyl group, which is always attached to carbon 5 of a cytosine. This chemical modification of cytosine does not affect its base pairing ability, so it does not directly alter the genetic code . Additionally, the methyl groups are usually added to cytosines that are present in CG sequences, with the C representing cytosine and the G representing guanine. The dinucleotide CpG is a common target for cytosine methylation by specific methyltransferases, forming mCpG. 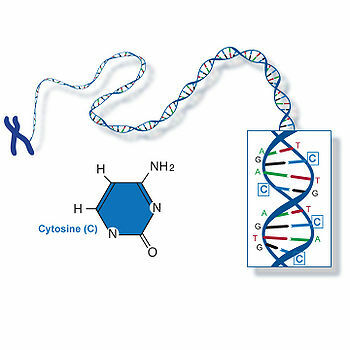 This cytosine methylation can be inherited because a specific enzyme called maintenance methyltransferase uses the parent strand of DNA as a template to methylate the daughter strand during DNA replication. It can be inherited in this way from the parents of an organism (a form of epigenetic inheritance), but may also arise new in an organism’s own lifetime. DNA methylation impacts genetic control by the repression of gene expression. Genes that are methylated are “turned off.” Transcription can be silenced by methylation of DNA by enzymes called DNA methylases. Methylation of DNA sequences can inhibit binding of proteins, including the transcriptional machinery and thereby block gene expression. DNA methylation accomplishes gene repression by attracting chromatin-modifying enzymes or interfering with gene regulation.. It is incredibly important in the growth of cells, because loss of DNA methyltransferases results in loss of cell growth control . Although the exact mechanisms involved in assigning DNA to be methylated aren’t completely understood, some new research implicates RNA in influencing DNA methylation patterns (Goldberg, et al., 763). ↑ 1.0 1.1 Karp, Gerald (2008). Cell and Molecular Biology:Concepts and experiments (5th ed.). Hoboken, NJ: John Wiley & Sons. p. 529. ISBN 978-0-470-04217-5. ↑ Alberts, Bruce; Alexander Johnson, Julian Lewis, Martin Raff, Keith Roberts, and Peter Walters (2007). Molecular Biology of the Cell (5th ed.). New York and London: Garland Science. p. 467. ISBN 0-8153-4105-9. ↑ Strachan, Tom; Read, Andrew P (2011). Human Molecular Genetics (4th ed.). New York: Garland Science. p. 262. ISBN 978-0-8153-4149-9. ↑ Goldberg, Aaron D.; Allis, C. David; Bernstein, Emily (February 23, 2007). "Epigenetics: A landscape takes shape". Cell (Elsevier Inc.) 128: 635-638. http://www.stanford.edu/class/cs273a/papers.spr07/10/epigenetics.pdf. Retrieved March 5, 2010. ↑ 5.0 5.1 Watson, Jamed D.; Baker, Tania A.; Bell, Stephen P.; Gann, Alexandrer; Levine, Michael. Losick, Richard (2004). Molecular Biology of the Gene (5th ed.). San Francisco, CA: Pearson, Benjamin Cummings/CSHL Press. p. 556. ISBN 0-8053-4642-2. ↑ Szyf, Moshe (2009). "The epigenetic impact of early life adversity". Montreal, Quebec, Canada: McGill University. p. 29. http://www.sfn.org/siteobjects/published/0000BDF20016F63800FD712C30FA42DD/0FA3A9660C429C4A8D797BA3A8217F4A/file/SC1_2009_4Szyf.pdf. Retrieved May 31, 2012.